It is still whatever you are opening it in most likely? I open and edit all these nsi files in notepad++. If you copy/past it to a new text document it should go away. Try following that and let us know if you have an issue. Good call; based on your suggestion I read the cgpsmapper directions. Turns out I had to change LBLcoding=9 (left the codepage=1252 because that allows lowercase letters) then also switched my shields to ~[0x01] and ~[0x02]. I'll be updating the default dictionary that comes with the tutorial to allow for this and also adjusting the tutorial to automatically handle interstates and US Hwys. 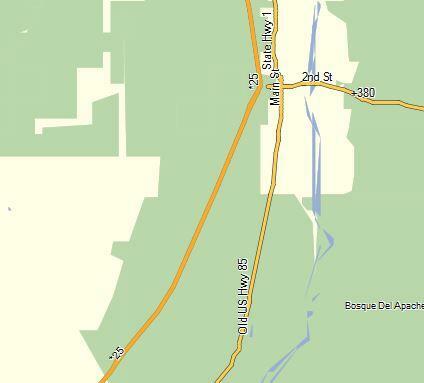 The I-25 is shown as *25 and the US Hwy 380 is shown as +380. I agree on unintuitive; if you figure out an efficient way just let me know and I'll start downloading. The trails shown on the map are from the USGS or National Forest Service. The multiple trail problem likely means other trails exist or used to exist per those sources. A few of the locations have trails based on people hiking it but the Chiricahua's are not one of those locations. If Hike Arizona would release all the trail data in one lump sum I would delete every single trail on the Arizona Topo and replace it with their data since it is likely more accurate. However, I can find a quick way to download them all or anything like that. If someone is willing to download all the trail files I would take them and add them in immediately. Exactly which map and do you see them in BaseCamp in the map products drop down menu at all? I'd also suggest installing the Arizona Topo and see if that works? If so, then try to install the WI Topo again and see if it shows correctly. The other option is to install it to C:\Garmin\witopo11 and see if that works. Using The Maps/Garmin Software / Re: How Do I Load Maps On My GPS Unit? Yea I debated that since I have the installer script already created. My problem is I feel that whole thing is "antiquated" since it does require you to load the maps to the C: drive which is not a great plan if you do a small(er) SSD for C: and store data in another location. I just posted a new version of the Arizona Topo installer that should not have this problem. You won't even have to modify the location of the map. Note: There is a new map install file. You definitely want to re-compile with the new version. Updated version here. Alright so I wiped a computer and spent some time experimenting. It turns out Windows 10 changed how the NSIS installer works to it "doubled" the registry and loaded it into the wrong spot. This meant that it wouldn't work. The weird catch was if you had previously installed one prior to the upgrade for some reason it installed correctly. Additionally, it doesn't appear to matter what directory it is installed in so for now i left Program Files (x86); if anyone has an issue let me know. Either way I fixed the map install nsi file. Updated version here. Rather than trying to experiment and find the right place in the registry it is now coded in correctly. Thus far I've updated the Arizona Topo install but I'll begin chugging through all my maps in the coming days to get the right version. Map Making Support / Re: Newly created map has no road labels and other expected features. I believe the Name is case sensitive (but I'm not sure). Use NAME next time. However, for now change the script from NAME to Name and it should work. From the word doc Windsor Pond should actually have a label in basecamp if you zoom in enough. The 0x07 type does not though. How big is one of your .mp files if you zip it? I'd like to take a look at the file. My guess at this point is that in QGIS the column name was not NAME and thus it didn't convert any of the labels from the .shp file over to the .mp file. %gpsfdshp2mpfolder%\gpsfdshp2mp.exe %%f "MP_TYPE" "NAME" n %dictionary_file% !initialmapid! !finalmapname! %gpsfdshp2mpfolder%\gpsfdshp2mp.exe %%f "MP_TYPE" "NAME" n %dictionary_blank% !initialmapid! !finalmapname! )Change the NAME to whatever your column is called in the shapefile. Create a new text file and copy and paste all the content into it. Save that then rename it as a .nsi file and try to compile. It sounds like an encoding error. I'd attach a new one but I can't do it from this device so that won't be until Monday.